This is a list of glitches in the game Mario Kart 7. In local multiplayer, if an A.I. player is struck before it flies off a glide ramp, making it fall into the lava, it respawns. Then, after it respawns, it may drive directly into the lava. The computer player can repeat this several times. Just before the bridge where the dinosaurs head is shown, the gliding ramp appears. If the player has the Flower Glider (because it's light and gets very high air) and goes off the gliding ramp and skips over the fence line, the game will count that as a lap. The player can also cut across the portion of the rock nearest to the fence, preferably landing in front of the last small ramp. If a Spiny Shell is active for 40 seconds, it will disappear. Upon reaching the glider panel, it is possible to glide over some areas of the fenced-off area, many parts of which will result in Lakitu pulling the player back onto the main course. However, near where the out-of-bounds area meets the track, it is possible for the player to land inside the area and clip through the fencing at the same time, without any problems or Coin losses. In local multiplayer, sometimes, when a racer (can be a CPU or a human player) gets hit and the balloon pops, another balloon immediately respawns and takes its spot. This glitch is caused by lag, and the more lag the player has, the more often it occurs. The glitch does not occur when two players are in the same view area. On GBA Bowser Castle 1, if the player jumps over the wall into the lava right before the 3rd turn, the player will be re-spawned near the second Boost Panel. This glitch saves 1 second, and can be done without a mushroom if the player drifts and jumps on the left wall after the 2nd turn and drives straight until he reaches the part where the two walls intersect. Note: As of May 15, 2012, a patch has been released for Mario Kart 7, which renders this glitch unusable in Online Multiplayer. However, it can still be performed offline. Sometimes on occasion, some information of the Ghost Data (seen in the Time Trial track selection screen) will become jumbled and become incorrect, such as the Ghost Time and the country flag. This can be fixed by moving through the Ghost list until the information reloads itself. The Ghosts have erroneously lined up in the center. Occasionally, the placement of the Ghosts on the screen will be incorrect. When the player reaches a blue ramp which activates the glider, they should turn around and drive backwards towards the ramp. Every time the player touches the ramp, they will just go forward as if they got bumped lightly and the sound effect for the glider coming out will play. Occasionally, the glider will come out, but the racer will go backwards. The player needs to go to Neo Bowser City (Koopa City) to perform this glitch. The player then has to go straight without turning. When they hit the wall they have to switch to gyro controls. The player next has to turn to the left a bit slowly and the cameras will go back as if the player is not using gyro controls. But, the player will be able to use gyro controls even though the cameras are showing the back of the kart. If the player turns around the cameras go back to first-person view. The player will need to go to N64 Kalimari Desert and drive to either side of the tunnel. To perform this glitch, the player must press both the and the buttons near the bricks of the tunnel's wall. They must then activate the gyro controls and spin around with the gyro controls or the . While spinning, the camera will once again switch to the third-person view. Likewise, driving away will end the glitch. On this track, just after the start of the second section, in the mouth of the cave, if the player turns around and hops in the water just after the fence ends, or uses a Mushroom to hit the rocks on the wall, the racer will be caught by Lakitu and, if done correctly, will make the player start at another area of the track, next to Summerstone Castle and at the top of the mountain, near the third section. This gives the racer a big advantage on the race, being easier to do in Time Trials as the player will start with three Mushrooms. The time saved is approximately 20 seconds. This glitch can also be performed by landing in the water beside the fence without touching the rocks. This is a much easier way to do the glitch and can be done without the help of a mushroom. Note: As of May 15, 2012, a patch has been released for Mario Kart 7, which renders this glitch unusable in Online Multiplayer. It can still be performed offline, however. The player needs to be Metal Mario in the B Dasher in Slick wheels and take the shortcut at the beginning of the level. In the part before the cannon where the player should turn left, the player should not. When going up the wall the player should then hold left and hop. The player might bounce on the floor and enter the cannon from a high altitude. If done correctly, the player will fly over part of the course and land by the Wigglers. The player needs to go to DK Jungle or GBA Bowser Castle 1 to perform this glitch. They will need to position themselves (near the Temple in DK Jungle) to face the left corner right beside the entrance. When they use the boost, the player will start jumping multiple times non-stop. The player will have to hold the / button to keep their kart jumping. If they let go of the button, they will get a small boost and move forward. This glitch is hard to master. This glitch is most easily done in DK Jungle. If the player's kart is wide enough (Medium + B Dasher + Red Monster works well) The player must go to the last jump ramp before the temple and fall off. If done correctly, Lakitu will pick the player up on the last ramp, facing to the left. The player must hold / the whole time Lakitu is dropping the player, so the player doesn't get the boost. The player must then keep holding / so the player drives forward. Of done correctly, the player will be bouncing by the entrance to the temple. If the player holds up, the player will bounce lower, while if down is held, the player will bounce higher. If the player hops right when hitting the ground, the player will bounce about twice as high. At the very beginning of the race, just before the racers enter the air vent area, it is possible to be pushed through the guardrails by a heavier opponent. This causes the player to helplessly fall to the ground, as if they had fallen off of the course normally. 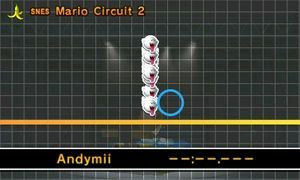 Lakitu will then pick them up as normal and then place them just before the curve. When finishing the 1st lap while the glider is still activated, the player can glide under the top portion of the track without using a mushroom. This shortcut saves just about 1 second, but it is very hard to pull off, due to the narrow opening. It will be easier if the player use the wind boost to the left (or right in mirror mode) of the finish line. In Piranha Plant Slide, when going down the pipe to go underwater, the player must jump at the right time in the middle of the pipe. They will twirl around and cling to the ceiling for a temporary amount of time. Also, if the player uses a Mushroom and jumps in the same spot, the player will twirl around the pipe, and spin out for no reason. This glitch also appears in Koopa Cape, when in the underwater pipe. One should hit one of the Cheep-Cheeps that swim through the pipe now and then, right at the moment that a trick is done over one of the small ramps. If one lands on a Cheep-Cheep, they bounce off to the ceiling and twirl around in the pipe. Another glitch can also be done. While the player goes down the pipe into the underwater section, the player must turn in the right spot. Then, they will be flipped upside down temporarily. This glitch also appears in Rosalina's Ice World. After the long turn right after the start, there is a corner with ceiling where the glitch can appear. One should be pushed away by a heavier person so that they hit the pointed top-right in order to twirl around the road. This glitch can appear in Bowser's Castle, but is extremely hard to perform. One must drive as far as possible on the left side of the large, spinning trunk and they should either use a mushroom, or be pushed away by a heavier character to bump into one of the steel pins that appear on the edge. If that pin at the moment touches the wall it is aside of, the player will get stuck for a couple of seconds and they will twirl and stay in the air stationary. They will fall down again when they have stopped with twirling. The player can use any kart, character and glider; the glitch requires a Mushroom. At the last ramp, the player must go straight, and cut the corner. When the player is about to fall over the precipice, they must use a Mushroom and hit the mountain above the entrance to the cave. By doing so, the player finds the wooden plank above the entry with the glider on. Also, if the player stays up there for a short time, Lakitu will place them back on the track near the entrance to the cave. The trick is similar to that of Toad Circuit. For an unknown reason, if the player does not check on the Mario Kart Channel for a long period of time, when they attempt to race with anyone from Streetpass, the 3DS will forever loop a "preparing screen". If the lid on the Nintendo 3DS is closed, or put into Sleep Mode on the 2DS, the 3DS will show the same image on the bottom and the Top screen, with the top screen askew from the rest. 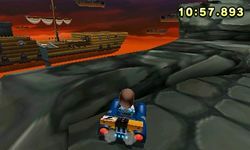 In Rainbow Road, the player must drive on the second blue Boost Pad to use the glider. They must slowly glide down and get under the next road. Gliding up, the player will occasionally cross it. To attempt this glitch, the player must be on Toad Circuit and have at least one Mushroom. When the gliding ramp becomes available, the player must carefully aim where the red Toad balloon is. When the player just starts gliding, they must pass the bridge and then aim towards the ground (without actually touching it - the player just has to be close to the ground). When the player passes the Coins, they must use the Mushroom and go up at the same time. Then the player will hit the face of the Toad balloon. While still pointing up, the player will then later hit the top edge of the tunnel. If done correctly, the player will become stuck on the top edge of the tunnel. The only way to end this glitch is to just point towards the ground or by pressing the B button. There are also some cases where the player goes through the ground when trying to end the glitch. 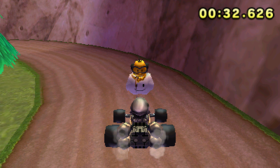 It is possible to cause a banana to clip through the player's kart while reversing. If a character somehow loses the second and third banana, only leaving the banana furthest away from the kart, and reverses, the banana left will still be attached to the kart as if it was still chained to the others. However, should the player reverse, the banana 'chain', following where the kart has been, will temporarily clip inside the kart itself. A portion of Airship Fortress is not rendered. In Airship Fortress, if the player looks backwards after being flying into the tower, the track near the starting line will not appear. This glitch requires the Roller wheels. In Piranha Plant Slide, directly after the start, three lines, one yellow, one red and one green, split the road in three sections. One should do a trick over the ramp and land right at the highest point of the yellow-lined road. If done correctly, the camera switches angles and the player can watch right through the wall. The effect stops if the player goes underwater after the road. This occurs mostly in the Multiplayer modes, but can also happen in Single Player, although perfect timing is needed. Usually, 1st place gets the winning fanfare and winning results music, 2nd-4th place gets the good fanfare and winning results music, and 5th-8th place gets the losing fanfare and losing results music in an 8-player race. There is no in-game timer during the race, but the game determines ranking by finish times; however, it does not actually determine which music would play at the end of a race this way. If two players were to cross the finish line at nearly the same frame while battling for 1st or 4th place, what is used to determine which result music is played is instead based on the running order of the players before the players finished, not by the race time of the players. When this happens, the player would sometimes hear the result music for a position higher than what position they actually finished in, and vice versa for the result music for a position lower than what position they actually finished in. On this track, on the dirt path by the lighthouse leading to the gliding section, if the player turns horizontally right on the boost pad and hops with a boost into the ocean, the player will be placed at the entrance to the town by Lakitu. This glitch is harder than the Maka Wuhu glitch. Before the last turn of the second section, there is a tree on the right side. If a Mushroom is used to boost through the grass just to the left of the tree and into the ocean, Lakitu will place the player just after the first turn of the third section. However, when crossing the finish line, it shows the player just crossing into the third section and immediately finishing, as the shortcut warps the player past the section border. This allows for third-section times to be less than 0.3 seconds. As of May 15, 2012, a patch has been released for Mario Kart 7, which renders these two glitches unusable in Online Multiplayer. However, they can still be performed offline. ↑ Losing music in 4th place out of 8. This page was last edited on February 2, 2019, at 00:40.